Some dieters say that bitter orange helps increase calorie burning and suppress appetite. 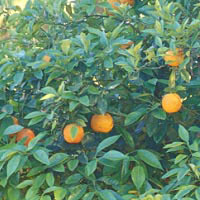 Bitter orange (Citrus aurantium) contains several substances known to stimulate metabolic rate, which should increase calorie burning. While no published research has tested it alone, it appears to be effective in combination with St. John’s wort and caffeine.